Everyone's favorite four-fingered yellow family starred in a hit moviein 2007 and are more popular than ever, making The Simpsons Halloween costumes as desirable as Duff beer and a doughnut. The family and their friends and neighbors make for a great group Halloween costume, so decide who's who early! 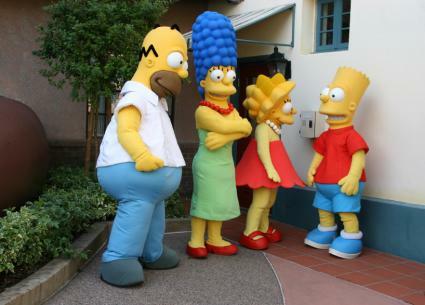 Your basic Simpsons Halloween costume isn't fitted, so you can feel comfortable shopping and buying online and know your costume will look good. If you want to look like you come from Springfield, you'll want to buy one of the many masks available, although you may have a hard time finding as wide a selection as you'd like, in which case you'll have to use a little imagination. Krusty The Clown Costume, which features the character mask and big white gloves, but not the clothes pictured. Mr. Burns Standard Costume, which includes a jacket, dickey, pair of pants and half-cap. You'll have to provide the slouch and obsessive, gleeful hand-rubbing. Few online shops currently have a large selection of masks, and it can be oddly difficult to find any for Marge, Lisa or Maggie. Spook Shop has one of the better selections, offering masks for Bart, Homer, Krusty, Mr. Burns, Radioactive Man and Moe the Bartender. 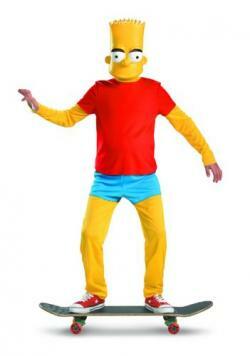 They have full costumes for a child Bartman, which includes Bart mask with purple half-mask, a jumpsuit featuring a red shirt over yellow arms, blue shorts over yellow legs, blue shoe covers and a purple cape. There is also a full-size adult Radioactive Man costume, which features a red jumpsuit with attached yellow cape, half-cap mask, yellow belt and gloves and boot covers. So what's a girl to do if she wants to be Marge? For a really top-notch mask, you can try Party Pants, a UK-based site that carries masks for Bart, Homer and a Marge with very detailed blue hair. Homer: Short-sleeved white shirt with collar, blue cuffed trousers, grey shoes. Rarely seen without a doughnut. Marge: Strapless tea-length green dress, red low-heeled pumps, red beaded choker. The tall blue hair is crucial! Bart: Red T-shirt, blue shorts, blue sneakers with white socks. Skateboard optional, attitude not. Lisa: Strapless red dress with handkerchief skirt, red Mary Janes, white beaded choker. Carry a saxophone and wonder if you might really be adopted. Maggie: Blue onesie, blue hair bow, red pacifier. The pacifier may not be to everyone's taste, but it's ideal if you're feeling antisocial that night. If you want to be a particular character and can't find the mask, or simply don't want to wear a full mask, you can try rigging a look from scratch. Marge's blue wig, for example, can be made using rolled-up posterboard and quilt batting, which you can then paint blue. Lisa's hair is more difficult, but if you have the dress and beads, a spiky yellow wig and yellow makeup will leave no doubt who you are. For many of the characters, like Smithers and Mr. Burns, it's all about the attitude, not the look. With Mr. Burns' evil laugh and Smithers' patient placation, you only need suits and glasses and maybe some age spots to look the part. Whatever you do, be sure to plan ahead, otherwise you'll find yourself saying "D'oh!" all night.